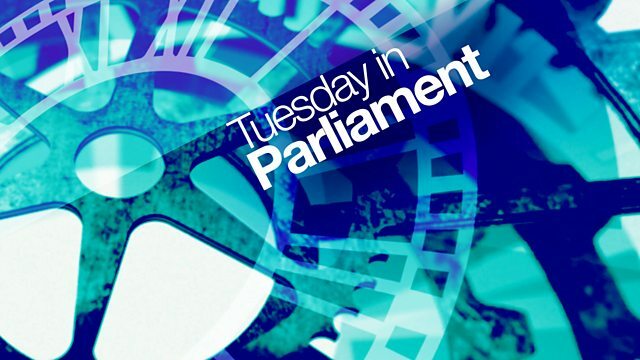 Highlights of proceedings in Parliament on Tuesday 20 March, presented by Mandy Baker. in the face with a wet fish. transition period in December 2020.
when it comes to the final deal? the transition period was over. part, the SNP were up in arms. else's's file for the Conservatives. about always blaming somebody else. a damn chick making a case. did they really care about fishing? will be voting Tory either. at an EU summit later this week. a statement to MPs on Monday. and 2009, or a dementia tax in 2017.
that should be a shame to miss out. Not much sign of consensus yet. in Parliament with me, Mandy Baker. some of its senior broadcasters. could pay a share of bills. have avoided other implement cost. because the law changed last year. BBC to what say we said last night. -- to say what he said last night. to set up a company. choice to agree to that. compelled to set up a PSC. point of nearly taken her own life. funeral because I had to get money. -- unable to take bereavement leave. they must face up to it. would focus on three areas. always mopping up after the event. The minute these problems are new. redundancies? What can he do? voice in the way these are run. at Grenfell Tower in London. what the fire risks were. to address any risks identified. it's unlikely to become law. of power sharing at Stormont. or in nuclear power stations. on the Nuclear Safeguards Bill. lordships was rubbish - literally. And he wasn't mincing his words. vehicle from which litter is thrown. recent action you referred to. And that's all we've got time for. So from me, Mandy Baker, goodbye.